The capital of the province of Malaga is a lively city full of interesting sites which combines tradition and modernity. Due to its privileged location and climate it is one of Spain's most popular travel destinations. Most tourists visit Malaga for the sun, the beaches of the Costa del Sol and the outstanding gastronomical offer. But Malaga has got a lot more to offer than beaches and nightlife. The cultural offer has converted Malaga into a popular city break destination. Since the city has been inhabited by a variety of civilizations like the phoenicians, greeks, romans and arabs culture lovers will find a wide range of interesting monuments to visit like the Gibralfaro castle, the Alcazaba fortress and the Roman Theatre. People who are more interested in folcloric and religious events will enjoy the celebration of the Holy Week (Semana Santa) in Malaga with scenes of intense popular devotion by penitents as the local public takes an active role in this traditional event. The automobile museum is located in the old Tobacco Factory of Malaga with a collection of almost one hundred exclusive vehicles from Ferrari to Bugatti. Art lovers will find in the Picasso Museum in Malaga the greatest collection of his work in Spain with more than 200 drawings, paintings, ceramics and sculptures which are exhibited in the Buenavista Palace. The collection of the Thyssen-Bornemisza Museum includes Spanish paintings from the late 19th century paying special attention to artists from Andalusia. The Centre for Contemporary Art in Malaga is the place to go for lovers of modern art. 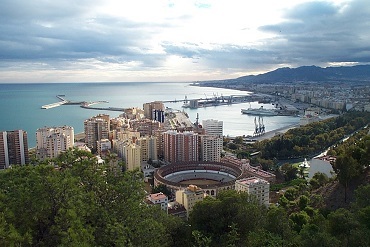 Malaga is also a popular destination for students looking for language courses. A number of reputable academies offering spanish for foreigners can be found in the city center or neighborhoods like el Cerrado de Calderón or El Palo. There are also language schools in other cities along the Costa del Sol like Benalmadena, Fuengirola, Mijas, Marbella or Nerja on the eastern part of Malaga. Many little villages in the province have small museums offering visitors information on the rich culture of Andalusia, like the Morisco Museum in Sayalonga, the museum of Popular Arts in Benalgabon or the Bandolero Museum in Ronda which shows the life of the most famous outlaws and bandits from the Serrania de Ronda and other parts of Spain. The museo Hojiblanca in Antequera is dedicated to olive trees and the production of olive oil with ancient olive oil mills going back in time as far as the 1st century. The Malaga Wine Museum and the Museo del Vino in Mijas are dedicated to the wine culture of the province and other areas in Spain. In the little white village of Mijas the Carrromato Max Miniature Museum is another exceptional exhibition and one of the most curious of the world in its kind. The Ceramic Museum Vistillas located in the Guadalhorce valley offers an Ethnographic Museum and a pottery workshop, which produces ceramics according to the century old traditions of this industry in Coin. The bullfighting museums of Ronda and Antequera located in some of the most beautiful bullrings in Andalusia are also noteworthy. Lovers of flamenco and spanish folk music will not find it hard to listen or even learn to play their favorite music at the many taverns, tablaos and flamenco schools in the province. The Cueva de Nerja stands out for its archaeological and geological interest. The International Music and Dance Festival takes place very year in the month of July. This is just a short list of sites and museums in Malaga which offer information about the artistic, cultural and historical heritage of the province. Many town halls in Malaga offer information on their website about the most interesting places to visit so it is a good idea to plan ahead and prepare your trip at home. For those who prefer to discover the area on the spot and like to improvise of go with the wind the local tourist offices might be a good place to get information and save time wandering around without really knowing where to go. Whatever your plans and your interests for sure Malaga and its province will not disappoint you. Cerámica Las Vistillas is an ethnographic museum and traditional ceramic workshop in the heart of the Guadalhorce Valley. Compare Valencia car hire and save money now! 5612 customers rated our services in Malaga with an average score of 8.3 out of 10 points.